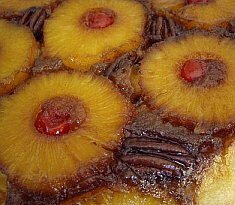 I have more than just a homemade pineapple upside down cake recipe from scratch, check out more homemade cake recipes at the end of the page. 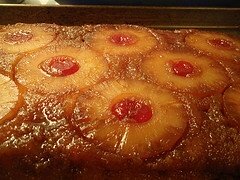 This recipe for pineapple upside down cake is my favorite. It produces moist, tender cake with a rich gooey pineapple topping that is out of this world. This homemade cake is wonderful. You may use dried cranberries instead of the pecans during the holidays. Place 14 pineapple rings on paper towels to dry. Save 1/2 cup of the pineapple juice. In a bowl, whisk the flour, baking powder and salt together; set aside. Mix the sour cream and vanilla together; set aside. Melt 4 tablespoons of the butter in the bottom of a 10 inch cast iron pan and add the brown sugar and bourbon (or rum). Stir and cook until sugar is dissolved. Place a pineapple ring in the center of the cast iron pan and the other 7 whole rings surrounding it. The other 6 halved rings go side by side against the sides of the pan; the edges touching the brown sugar. Place the pecan halves in the center of each ring and in the gaps between the fruit. Place the remaining stick of butter (8 tablespoons) in a mixing bowl and add the sugar; beating until light and fluffy. It will take at least 6 minutes, and important to this recipe. Add the eggs, beating well after each addition (approximately 2 minutes for each egg). Now tenderly fold in the dry ingredients alternately with the sour cream, using a rubber spatula. Spoon over the top of the pineapple and smooth the top of the cake batter so it is even. Bake for 25 to 35 minutes or until a toothpick comes out clean. Bring it out of the oven and poke a few holes in the cake. Drizzle with pineapple juice. Run a knife around the outside edge of the cake and turn it out onto a large serving plate. Use a spatula if any of the pineapple sticks. Serve with whipped cream and enjoy. PREHEAT oven to 400 degrees. Spray a 9 inch cake pan with vegetable oil. Place a sheet of foil or baking sheet on the bottom of the oven to catch spillage. Mix 5 tablespoons of butter with the dark brown sugar and 1/4 cup of pineapple juice; placing this mixture on the bottom of the cake pan. Arrange pineapple slices with maraschino cherries in the center of the rings over the brown sugar mixture. Beat two egg yolks until lighter yellow and add the remaining 1/2 cup pineapple juice, vanilla extract and remaining melted butter. Add this mixture to the dry ingredients. Mix well and gently fold in the egg whites. Pour cake mixture over the pineapple rings. Bake for 30 minutes and let cool in the pan for 10 minutes. Cover the pan tightly with a plate and invert so the pineapple/cherry side is up. NOTE: If you want to topping to be harder, just place the cake (pineapple side up) under the broiler in the oven for a few minutes. Now on to my next easy pineapple upside down cake recipe.